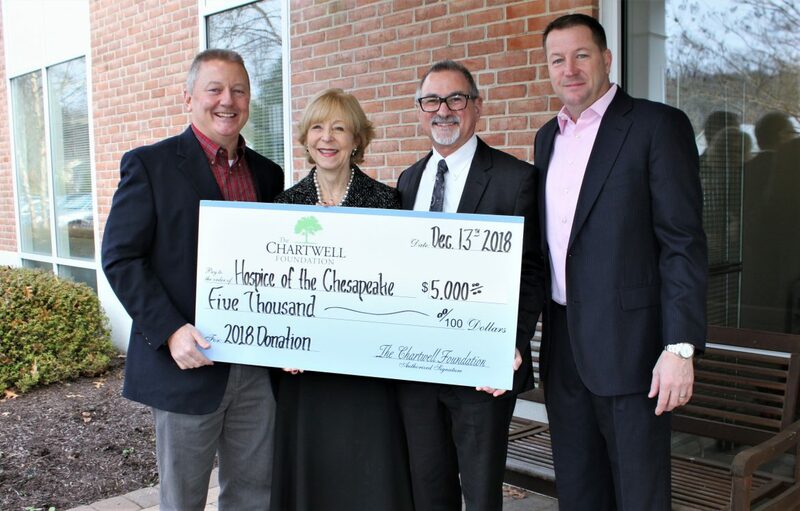 The Chartwell Foundation paid a visit to Hospice of the Chesapeake’s John & Cathy Belcher Campus in Pasadena on Dec. 13, to deliver a $5,000 check as part of their annual giving campaign. Hospice of the Chesapeake has been a fortunate recipient of giving from the Severna Park community organization for the last 13 years. Hospice of the Chesapeake Major Gifts Director Lynne Davidson and CEO Ben Marcantonio accept a donation in the amount of $5,000 from Steve Lombardo, left, and Joe Flynn, right, respectively the outgoing and incoming presidents of the Chartwell Foundation.